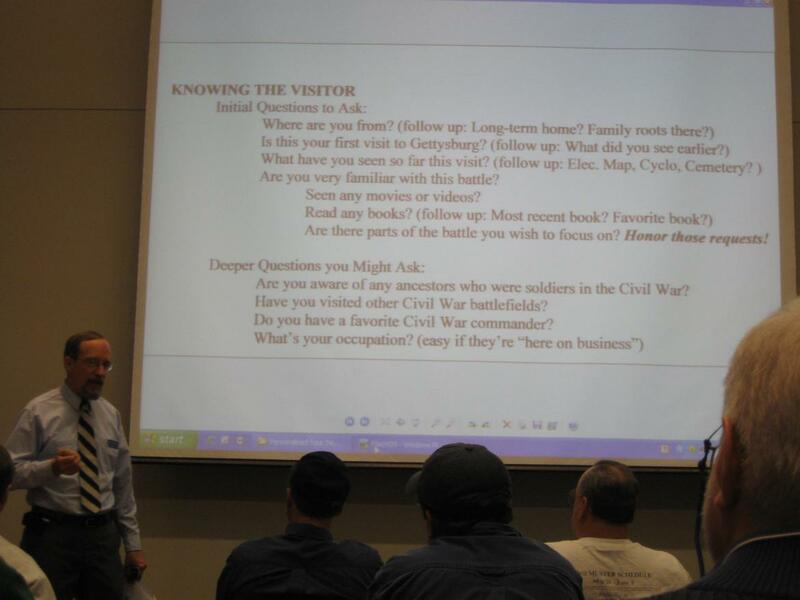 Licensed Battlefield Guide supervisor, Clyde Bell, greets the 19 candidates in the Ford Education Center, or Ford’s Theater as we like to call it. This view was taken facing northeast at approximately 8:15 AM on Saturday, February 21, 2009. 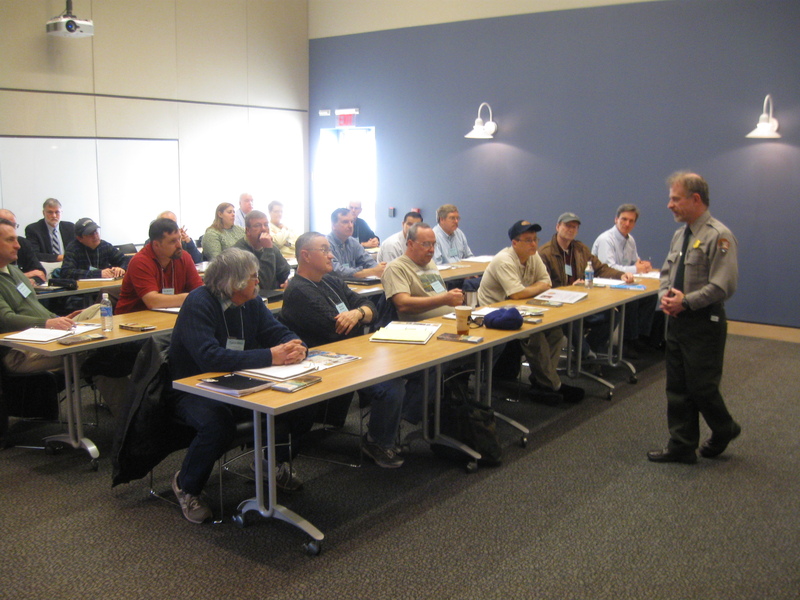 The National Park Service and the Gettysburg Licensed Battlefield Guides conducted training for the newest Licensed Battlefield Guide candidates. 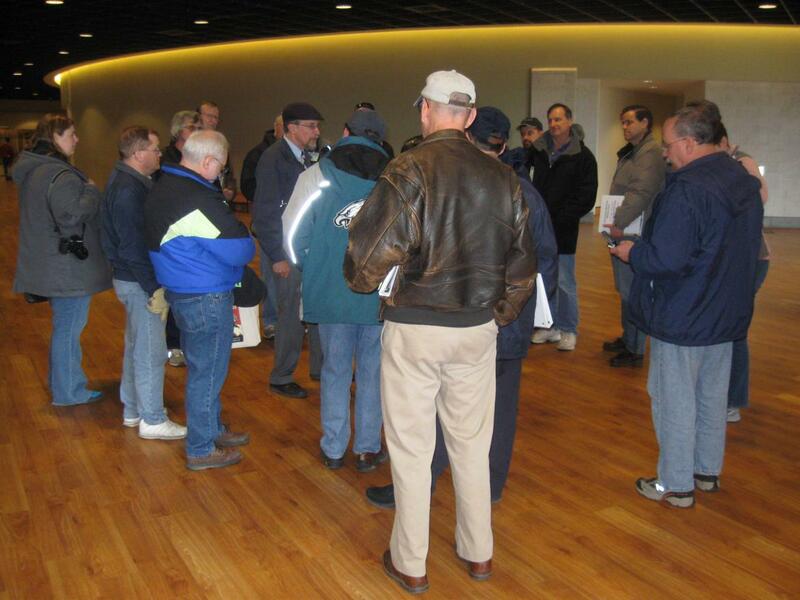 On December 6, 2008, 135 individuals showed up to take the guide test. Of those, the 19 highest scorers were invited to this training to see if they can pass the “oral examination.” The guide exam is offered every two years. The last batch of high scorers had 21 candidates. Of those 21, nine advanced to purchase their license. 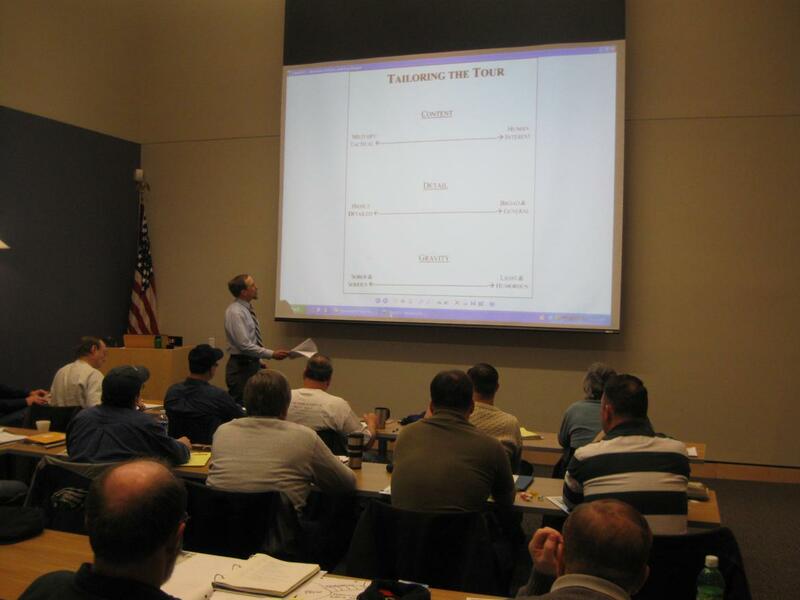 The mandatory guide candidate training covers two days, and, among other topics, it attempts to give candidates an idea of the reality of guiding, how to create site specific tours, and how to prepare for the oral examination. All 19 candidates showed up for both days of training. One of the primary purposes of the training and the oral examination is to see how flexible the candidates are in changing their tour to fit their visitors. They are tested to see if they will adjust to suggestions made by their National Park Service/Licensed Battlefield Guide examiners. 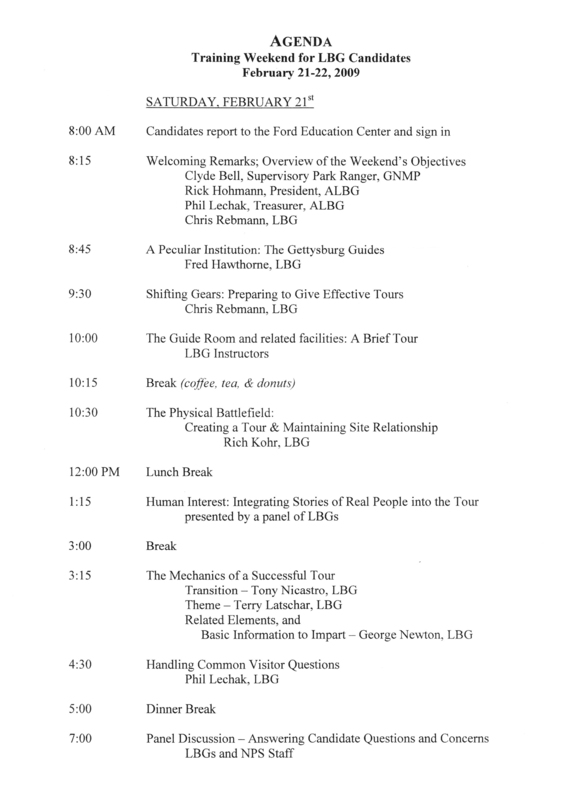 If a candidate is inflexible, what type of tour might a visitor receive? 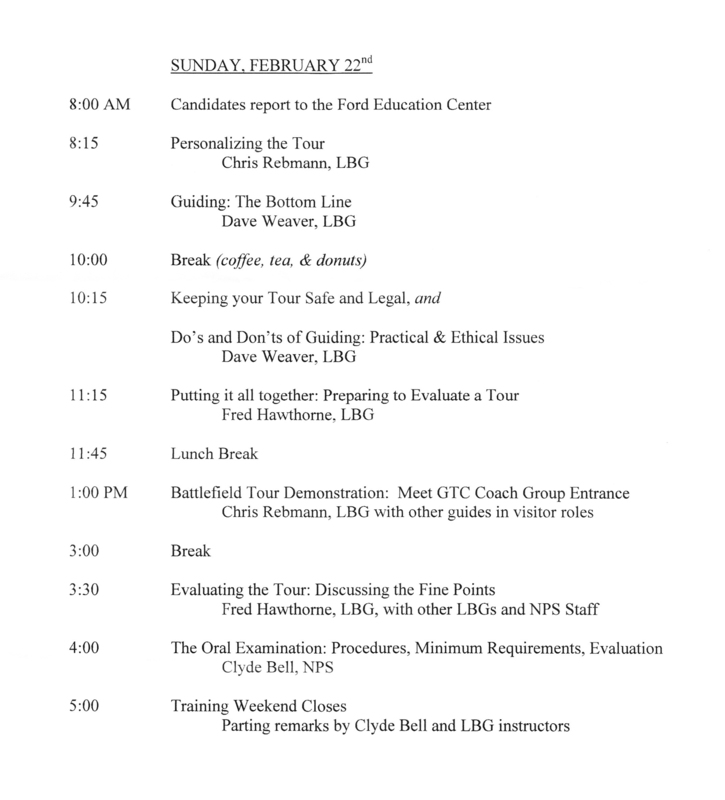 The agenda for the first day of training. To view both pages in PDF format click here. This paper was scanned facing south at approximately 4:00 PM on Sunday, February 22, 2009. Clyde Bell is giving an overview of what the candidates should expect for this weekend of “charm school,” as the training is now called. The first day, Saturday, wasn’t scheduled to end until approximately 8:00 PM. On Sunday the training was to wrap up soon after 5:00 PM. This view was taken facing southeast at approximately 3:30 PM on Saturday, February 21, 2009. 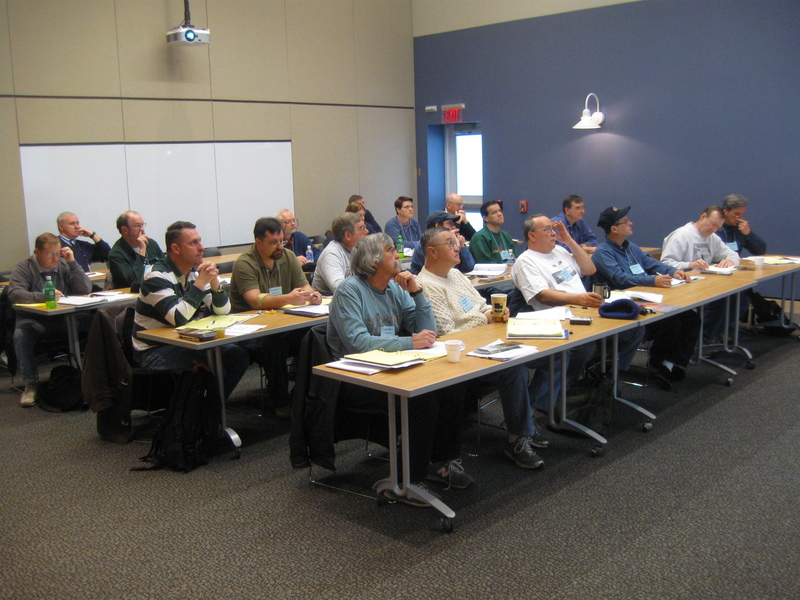 The training consisted of various speakers, who except for Clyde Bell, were all Licensed Battlefield Guides. 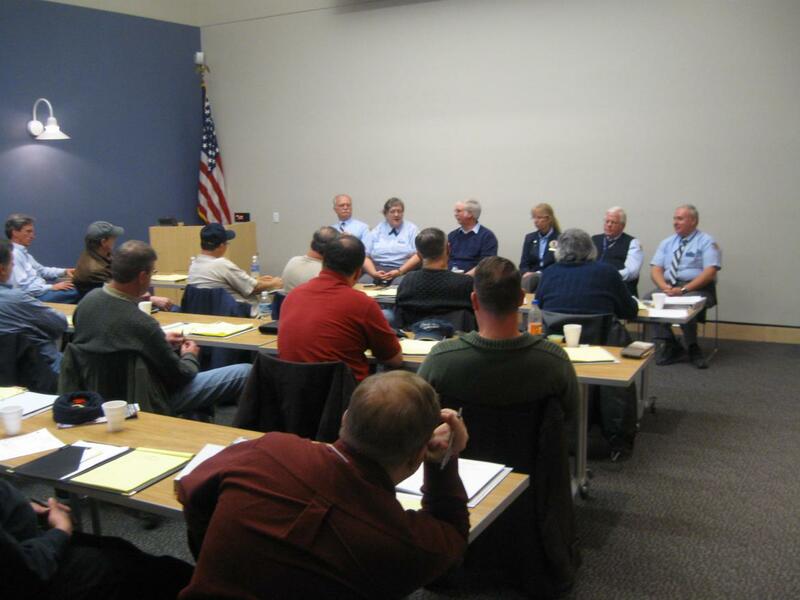 This panel is presenting, “The Mechanics of a Successful Tour.” The guides from left to right are Phil Lechak, Christine Wolfe, Ed Guy, Terry Latschar, Tony DeLacy, and Fred Hawthorne. This view was taken facing southeast at approximately 3:30 PM on Saturday, February 21, 2009. On Sunday, day two, Licensed Battlefield Guides Chris Rebmann presented his program on “Personalizing the Tour.” This view was taken facing southeast at approximately 8:15 AM on Sunday, February 22, 2009. 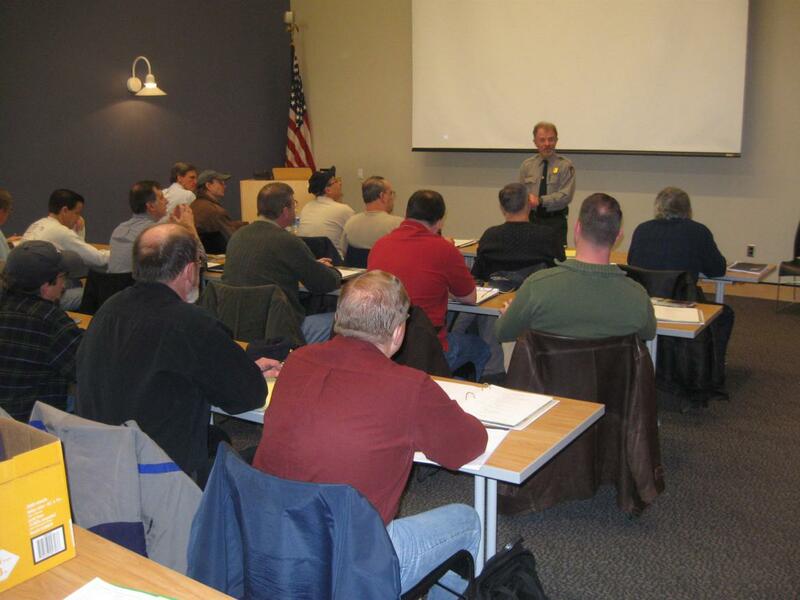 All 19 candidates decided to show up for the second day of training. It’s up to the NPS/LBG examiners to decide which ones they feel comfortable with driving cars of and working with total strangers for a two hour tour of the battlefield. This view was taken facing northeast at approximately 8:15 AM on Sunday, February 22, 2009. In this video, Chris Rebmann explains that because there are over 150 guides there can be over 150 different ways to present the battlefield to visitors. This view was taken facing southeast at approximately 8:15 AM on Sunday, February 22, 2009. Here Chris has posted questions to ask visitors when one first greets them, and other questions to ask visitors in order to get a better idea of how to “tailor” the tour. This view was taken facing south at approximately 8:15 AM on Sunday, February 22, 2009. One of the highlights of the training is to go on an actual tour with a Licensed Battlefield Guide and see how he/she does it. Most of a guides’ tours will be in the visitors’ vehicles, and the oral examination will be conducted in the candidate’s car. 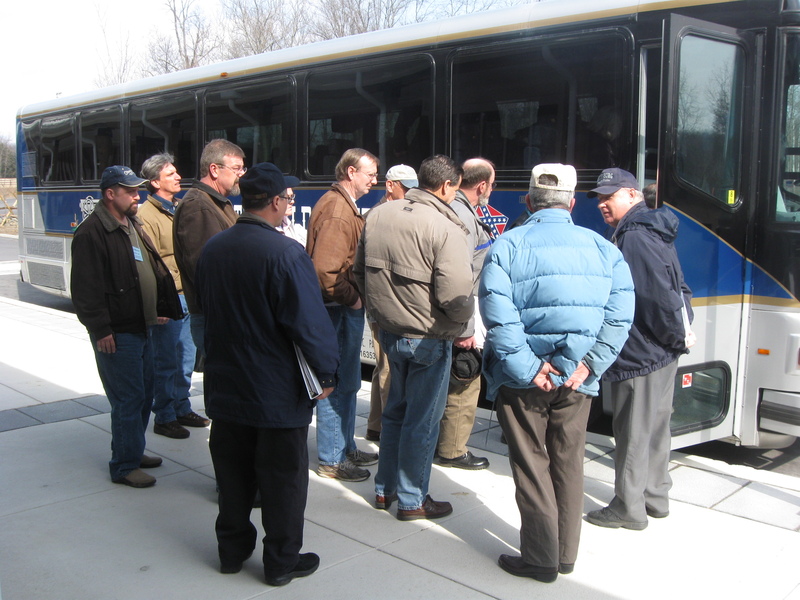 Unfortunately, when the 19 candidates and Licensed Battlefield Guide visitors and instructors go on the tour, they can’t all fit in a car. Therefore, the tour is in a bus. 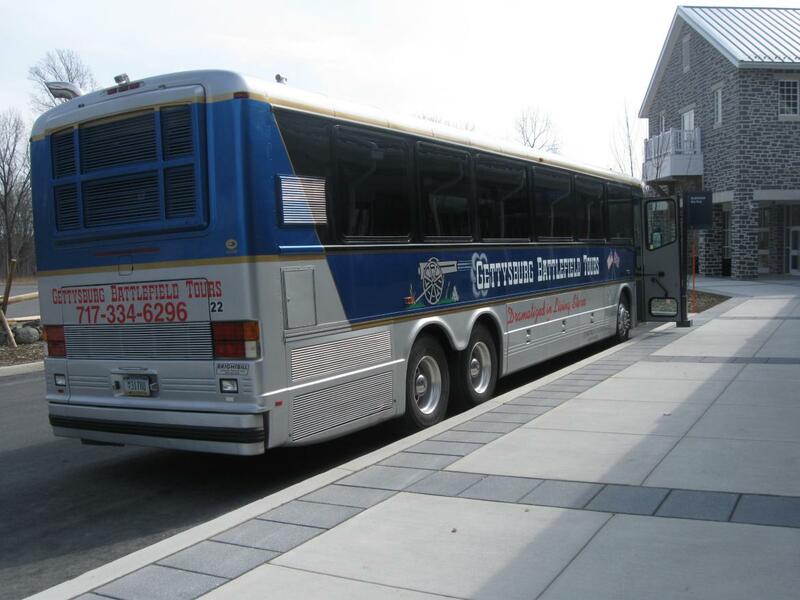 Believe us when we say that bus tours are not the same as car tours. This view was taken facing southeast at approximately 1:00 PM on Sunday, February 22, 2009. Chris Rebmann will be the guide taking “visitors” on the tour, and here he greets the visitors in the lobby, and gives them a brief introduction. Of course all the candidates are intensely listening except for the person on the right with his cell phone. This view was taken facing west at approximately 1:10 PM on Sunday, February 22, 2009. Two Licensed Battlefield Guides play the “visitors” to whom Chris Rebmann must personalize his tour and work with their interests. The LBG/visitors are Mike Kanazawich (pretending as if he is a visitor from New York) with his back to the camera and the National Park Service brochure in his left hand, and Linda Clark (pretending as if she is a visitor with Tennessee roots) with the brochure in her right hand. This view was taken facing north at approximately 1:10 PM on Sunday, February 22, 2009. Everybody loads the bus. Chris went down Baltimore Street, and then headed for the Eternal Light Peace Memorial on Oak Hill. Remember, a guide candidate in order to pass his/her oral examination must cover the highlights of the battle, including Culp’s Hill, in approximately two hours. This view was taken facing east at approximately 1:10 PM on Sunday, February 22, 2009. We waited for the group at the Peace Light, but it was a very windy day. Chris, adjusting to the weather conditions, chose to keep his group on the bus and show them the field without getting them out here. 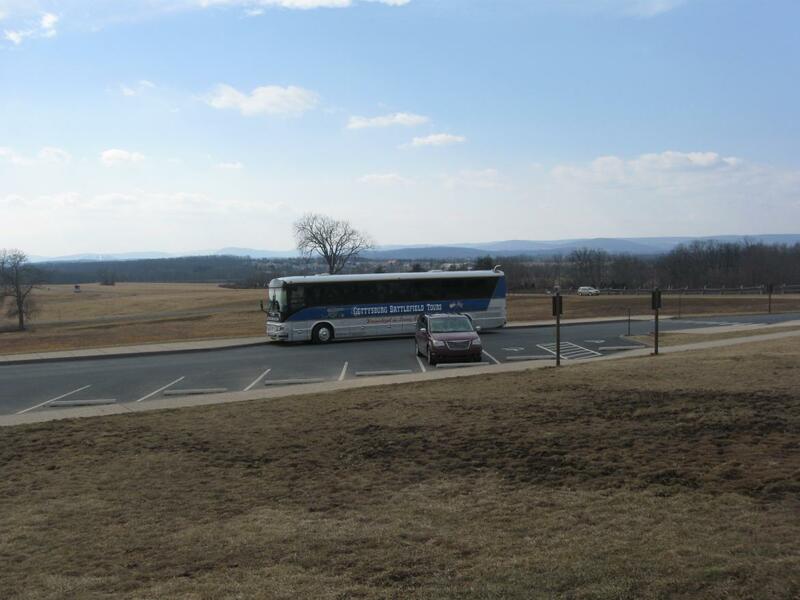 However, they did get out a little later on Oak Ridge at the monument to the 83rd New York. This view was taken facing southwest at approximately 1:25 PM on Sunday, February 22, 2009. 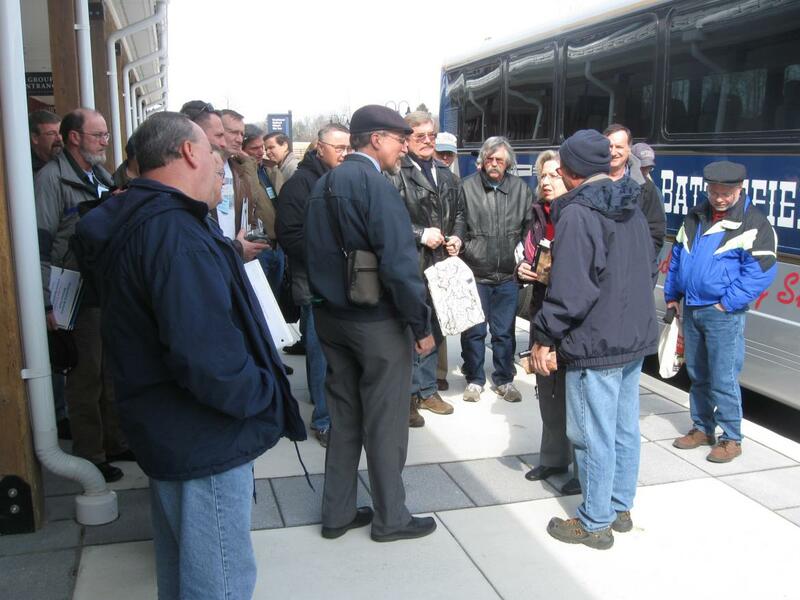 Gettysburg Artillery with Licensed Battlefield Guide George Newton please click here.